Chinatown is a historic, ethnic neighborhood in Los Angeles that has served as a port of entry for immigrants of diverse national origins throughout its more than 156 year history. The first record of Chinese people in Los Angeles dates to 1852. By 1870, an identifiable Chinatown was situated on Calle de los Negros. A 1931 Supreme Court ruling approved condemnation of that Chinatown to allow for the construction of Union Station, which resulted in Chinatown’s relocation. On June 28, 2008, the 70th anniversary of the historic 1938 grand opening of “New Chinatown” was celebrated. Chinatown’s current population is 12,000, comprised predominantly of Asians and Latinos. Now located slightly northwest of its original spot, Chinatown reaches from the Pasadena Freeway to Alameda Street with College Street providing a rough boundary between the older and newer businesses. Many businesses belonging to the original American-born Chinese families occupy the northwest area of Chinatown while in the southeast, first generation Southeast Asian immigrants and refugees of Chinese origin own the businesses. 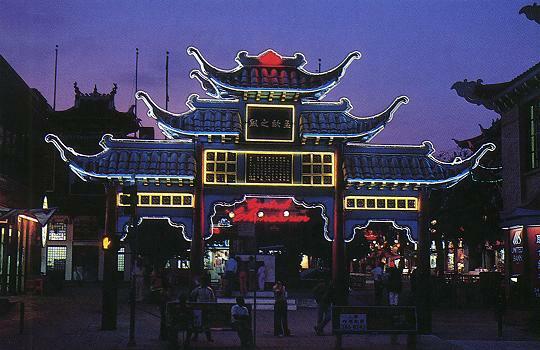 Over the past decade, the design and completion of several public-private partnership projects involving city agencies and Chinatown community organizations have expanded Chinatown’s cultural heritage preservation efforts. The Chinatown Angels Walk was a joint city-community project consisting of 16 7-foot-high and 2-foot-wide stanchions located throughout Chinatown that provide a self guided walking trail commemorating the community’s history, architecture, and culture. After 20 years of community dedication, strong leadership, and support from the city, the Chinese American Museum opened in 2003. It is located in the Garnier Building inside the El Pueblo monument—a 44 acre state historic park—and is the first such museum in southern California dedicated to the Chinese American experience and history of the region. The Garnier building is the last of the oldest buildings of “Old Chinatown” that was exclusively and continuously inhabited by Chinese immigrants since it was constructed in 1890. It is listed on the National Register of Historic Places as part of the Los Angeles Plaza Historic District. The museum’s extensive school-based education program works to creatively engage thousands of students each year with Chinese American experience, history, and culture while encouraging them to explore on their own. In 2008, the Chinese Chamber of Commerce of Los Angeles presented the 109th Golden Dragon Parade and Lunar New Year Festival. More than 110,000 people lined the parade route. This annual celebration has become the premiere cultural event of the southern California Asian American community. The Los Angeles Conservancy gives preservation awards each year, and Chinatown’s Sun Mun Way Lofts received an award in 2007 for an adaptive reuse of a 1939 building in Chinatown’s Central Plaza as residential and creative office space. This project renewed a neglected structure while reclaiming its colorful past and fueling the neighborhood’s revitalization.